Breast cancer survivor Darla Winland is raising awareness about alternate screenings. This photo of Darla Winland was shot while she was undergoing treatment, in February 2015. She chose to be photographed bald for materials that helped raise awareness of breast cancer screening. 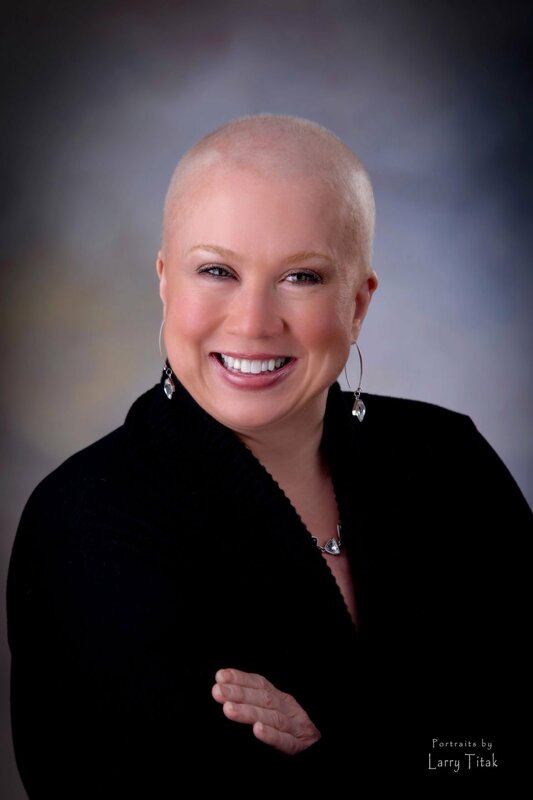 "A bald photo is so powerful for women who have been through cancer to identify with," she says. Darla Winland’s maternal aunt succumbed to breast cancer at age 50, which means Winland has been hyperaware of her family history of breast cancer and her own need for early mammograms. So she started getting the screening, typically recommended by doctors when a woman turns 40, early. Winland started going to regional experts at Rush University Medical Center and Northwestern Memorial Hospital, obtaining, she thought, the best possible medical screenings for herself given her family history of breast cancer. Her diligence made the discovery of a lump in her breast in August 2014 all the more shocking. Winland was in the best physical shape of her life, getting up at 5:30 every morning for CrossFit workouts. In the shower after her workout one morning, Winland felt a lump. She was immediately alarmed and later asked her husband to feel it. When he confirmed her concerns, Winland hightailed it to Northwestern the next day, seeing a doctor who felt not one, but three lumps. Winland felt blindsided. “Here I thought I was doing the very best for myself, getting my annual mammograms,” she says. Her doctor ordered an ultrasound that day, after which it was confirmed she had cancer that needed to be taken care of right away. It turns out that Winland’s many mammograms hadn’t detected the cancer because of her dense breast tissue. After her ultrasound, Winland continued on to biopsies and, finally, a breast MRI to see how far the cancer had spread. She asked the MRI technician if women with dense breast tissue like hers typically have annual breast MRIs as part of their cancer screenings. Winland was shocked at the answer, which was, “No.” Winland says, “I cried. Why did no one tell me? Why was no one telling women they may need this other screening?” Having been so aware of her family history of breast cancer, Winland would have most certainly gotten the MRI every year. Since her diagnosis, Winland has undergone a double mastectomy, six months of dense dose chemotherapy, seven surgeries, and 33 radiation treatments, in addition to a yearlong stint on an experimental drug. One of Winland’s doctors told her later that finding her cancer via mammogram would have been like looking for a single snowflake in a snowstorm. Her surgeon estimated that her cancer had been spreading for two and a half years. “That’s two or three mammograms that didn’t catch it,” she says. The cancer was rated as Stage 3C and doctors told Winland that, had she been undergoing MRI screenings, they might have caught it before or at Stage 1. Treatments at that low stage are less invasive and life-altering. Now, Winland is making it her mission to spread the word about the need for further cancer screenings in women with dense breast tissue. She is often invited to speak to local women’s groups, and she is a committee member, fundraiser and fashion show model for the Indiana Women in Need (IWIN) Foundation. The organization supports women receiving treatment for breast cancer “by securing and paying for individual services that relieve emotional, physical and financial burdens,” according to the website. Winland was a recipient of the Foundation’s generosity while undergoing treatment. If there’s anything Winland says she could have done differently with regard to monitoring her breast health, she says she would have been serious about doing the recommended self breast exam. Self exams are often key in identifying tumors and swollen lymph nodes. And, of course, Winland would have gotten the MRI screening she now knows she needed. Winland is currently dealing with the aftermath of cancer treatment. Her health is improving, but “chemo ravages your body,” she says. She has joint and feet issues along with lymphedema, swelling in her arm due to the removal of lymph nodes as part of her treatment. But neither the cancer nor its effects can prevent her from living a full life. Winland and her husband have a blended family of six kids, ages 13 to 20. She is a real estate broker and has other entrepreneurial endeavors. And she makes it a point to talk to every woman she can about breast cancer screenings. It’s too important not to talk about. While breast cancer is more than 100 percent less frequent in men, doctors do recommend periodic self exams. “Gynecomastia, which is the development of breast tissue in males, does occur, usually secondary to medications, underlying medical conditions, and many times with unknown cause,” says Tiffany L. Robinson, MD, director of breast imaging at Franciscan St. Margaret Health. “These men may present with either a breast lump or breast pain and we can assess and diagnose them with a clinical exam, mammography and ultrasound.” Men aren’t typically screened for breast cancer since they account for less than 1 percent of all male cancers in the United States. Robinson encourages all men to perform self exams and to watch for abnormal pain, discharge, or a palpable lump, seeking out care from a physician if any of these symptoms arise. Who should be Prince of the Blue at the Fair Haven Fairy Tale Ball? Vote here! Voting ends at 5 p.m. Friday, Oct. 12.